All Bunco All the Time! Score sheets, Tally sheets, Bunko rules: Beer Punch (aka Raspberry Beer Cocktail)!! We hope you all enjoyed the Memorial Day weekend! Here in Atlanta, it was hot but lovely, perfect for hanging out at the pool, a cookout, or just out on the porch. We had great holiday weekends with our families and friends, appreciating all that the service men and women of the U.S. have done for our wonderful nation, now and of course in the past. They are heroes, each and every one. In honor of Summer's official kickoff weekend, we wanted to share a favorite recipe with you - "Beer Punch." OK, we must admit, it's not really called Beer Punch.... its technical name is actually the much-more dignified "Raspberry Beer Cocktail." This moniker was bestowed by that holiest of Southern home bibles, Southern Living. (And to our friends above the Mason-Dixon line, we still recommend this magazine and its website as a must read)! Lindsay discovered this delicious drink mix a few years ago and served it at a party; needless to say, it was a hit with both the male and female guests, and she has been making it for special occasions (i.e., showers, get-togethers, Fridays) ever since. The reason for the name change? 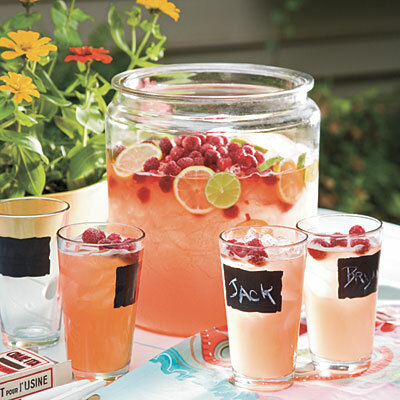 You can substitute the frozen raspberry lemonade for any frozen, concentrated punch or juice mix. All that we've tried have been equally delicious! So please do yourself a favor and try this delicious and oh-so-easy recipe at your next gathering... we're telling you, you'll love it!! ** (Lindsay's note: this recipe makes 6 modest servings... don't be scared to triple or quadruple this one)! **(Lindsay's note: orange slices, strawberries, blueberries, kiwis, and any other fruit or berry you want to cut up and add in are welcome additions too)! 'Such Pretty Things' - such a pretty blog!! Cake balls, how we love thee!